The OM-CP-MOTOR101A Series measures and records on and off status changes for motors or other equipment drawing up to 200 Amps. The state change occurs when the current switch exceeds the 150 mA set point. This allows for most basic equipment to be monitored. The current switch monitors whether there is current passing through a wire around which it is attached. OM-CP-MOTOR101A to measure. The device can hold up to 406,323 state changes, but memory will only be used if the status has changed. The device can be programmed to check for status changes 4 times per second up to once every 24 hours. Data retrieval is simple. Simply plug it into an available USB port and our user-friendly software does the rest. The software converts a PC into a real-time strip chart recorder. Data can be printed in graphical and tabular format or exported to a text or Microsoft Excel® file. The storage medium is non-volatile solid state memory, providing maximum data security even if the battery becomes discharged. Nota: Comes complete with 3.6 V lithium battery and operator’s manual. 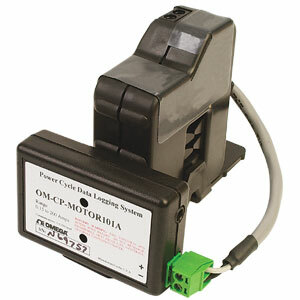 OM-CP-MOTOR101A-KIT includes OM-CP-IFC200 Windows software and USB interface cable.